Social Tech Trader is a Scam - Review with Proofs! Social Tech Trader by Albert promises to generate profits for you automatically, but is it too good to be true? Indeed, because Social Tech Trader is a scam. Let’s find out the truth behind the scam in our in-depth Social Tech Trader review. Albert, the alleged owner of Social Tech Trader scam introduces himself as a former banker who left his job at age 37. 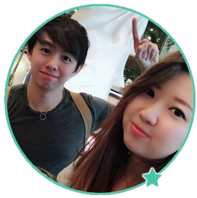 Together with his colleague, he created Social Tech Trader automated trading software to help people profit in binary options. It sounds great on paper and Albert seems like a guy who is trying to help people, but don’t be fooled. Social Tech Trader is a scam, despite all the sugar-coated promises that Albert is telling you. Of course, this headline is there just to attract the eyeballs of unsuspecting internet users and make them watch the entire sales video. It is in the sales video where Albert tries to brainwash his potential victims into paying for the scam. Yes, even though Albert repeatedly promises that the software is free, it doesn’t come free at all. I’ll reveal how the scam makes money off you at a later part of this review. Before that, let’s look at some red flags that we’ve discovered within Social Tech Trader scam. You can refer to the first image in this review for the quote. To verify the authenticity of this quote, I decided to search the website of FOX Business for anything remotely related to Social Tech Trader. Unsurprisingly, Social Tech Trader scam wasn’t even mentioned in the website. Other search terms such as “profit making software” did not yield any results, too. Apparently, the scammers are just leveraging on name of FOX Business to boost their own credibility, even though they weren’t mentioned by the site at all. If you scroll down the sales pages of Social Tech Trader scam, you’ll see quite a few testimonials of members who alleged used Social Tech Trader software and has made some significant profits. One of them is Suzanne Schmidt from Derby, UK. She claims to have made a total profit of $67,184.20 from Social Tech Trader software, and her photo is attached to the testimonial. To verify the identity of these members, I decided to perform a reverse search based on the photos. And the results isn’t encouraging. Suzanne Schmidt doesn’t exist, and all the other member profiles are also made up of photos stolen all over the internet. 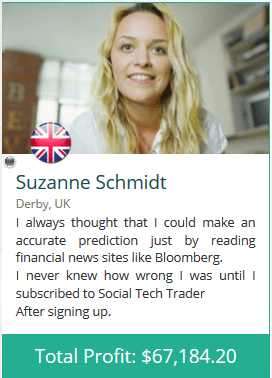 If Social Tech Trader is really as good as advertised, why would they need produce fake members and testimonials? There’s only one reason – because the scammers are out to get your money, but the software doesn’t work as advertised at all. Since this is a binary trading software scam, I want to explain how binary trading works first to make sure everyone is on the same page. If you have traded binary options before, you may skip ahead to the next segment. Binary options is a hugely simplified form of trading – instead of reading news and analyzing charts, you only need to guess if the price of an asset will rise or fall after a short period of time, usually between 30 seconds to minutes. This is how it works – let’s say I guess that the price of oil market (or any other tradable assets) will rise after 1 minute, and I invest $50 in a 1-minute contract. When the time is up, and the price is indeed higher, I win a certain percentage of what I bet, usually between 60% to 80% (between $30 to $40). But if I’m wrong, I lose the entire sum that I bet. In practice, trading binary options is not that different from gambling. There’s just no way to predict the market direction in such a short period of time. The odds of winning a trade is just like guessing the outcome of a coin toss – it’s 50-50. Even if you manage a 50% win rate, you’ll still lose money due to the uneven winning vs losing payout. The game is designed to work against you – who would risk $50 to potentially win just $30 to $40 in a game of coin toss? This is why the vast majority of binary options traders lose money. If you decide to sign up for Social Tech Trader, you’ll have to register for a broker account through their sales page (which is an affiliate link). The scammers will earn a sum of referral fees as soon as you deposit into the account. I was assigned to BinaryBook, an affiliated broker with Social Tech Trader. The minimum deposit with this broker is $250. Even if you already have an account with their recommended broker, you have to register for a new one using a different email address. This is because the scammers behind Social Tech Trader cannot earn their referral fees unless you sign up for a trading account through their affiliate link. 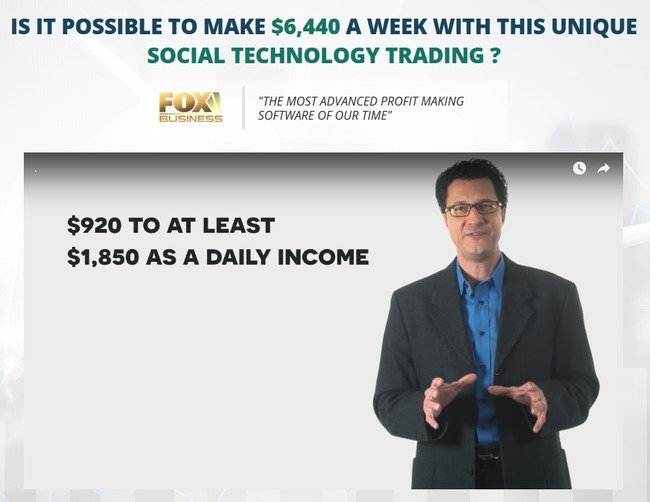 Not only that, Social Tech Trader will continue to earn commissions off you in the long term. The team behind the scam will earn a commission for every trade that their software makes for you. The scary part is, since Social Tech Trader runs on full autopilot, they decide your trading frequency and trade amount. They can dictate how much commissions to earn off you as long as you still have balance inside your trading account. Social Tech Trader scam will profit regardless of whether you make or lose money, ALL ON YOUR EXPENSE. Is Social Tech Trader a Scam? YES, SOCIAL TECH TRADER IS A SCAM. As we’ve said in the review earlier, we don’t recommend binary options trading as a way to make money online, at all. It’s basically the same as gambling, and using an automated trading software doesn’t make a difference. You are essentially putting your hopes and entire investment in a piece of software that gambles on your behalf. Social Tech Trader is no doubt a scam. Stole my $350 deposit. I did not make any trades. The software is switched off and logged out. But my account was drained. No record of trades on the broker account. Stay away!!! Massive scam!! Hi Gary, that’s awful. I’ve been scammed in similar ways, and it’s frustrating. Don’t buy into opportunities that sound too good to be true in the future. All the best!